How do we know when we are being told the truth? Is the truth simply factual or does perspective and experience play a role in determining what one’s truth is? According to Dr. Michael Eric Dyson, the answer is all of the above. A sociology professor at Georgetown University, Dr. Dyson uses his latest book, What Truth Sounds Like: RFK, James Baldwin, and Our Unfinished Conversation About Race in America, to narrate a moment in time when a privileged cis-gendered straight man had to come to terms with the fact that the identity of America was not the achievement of life, liberty, and the pursuit of happiness but the past, present, and future implications of institutionalized racism, sexism, and oppression. In this book, Dr. Dyson provides anecdotal and historical accounts of how society, as a whole, and individual world leaders have reacted when addressed with conversations about race in America. He uses his background in sociology to provide an understanding of how democracy was meant to function in a society that proclaimed freedom for all while enslaving “others” and after committing genocide. With this book, Dr. Dyson manages to combine thought-provoking stories with explanations surrounding the history of race in America with the hopes of readers understanding that understanding one’s truth means acknowledging their experience. The book focuses on interactions between Robert F. Kennedy and Civil Rights activists and also seeks to elucidate why African Americans have a complicated relationship with the leaders of the Democratic Party. Dr. Dyson begins the book with a secondhand anecdote of a meeting between Kennedy and famed figures and activists during the Civil Rights Movement. He discusses how Kennedy is often acknowledged for supposedly being a formidable ally of the Civil Rights Movement despite making “minimal efforts” over the course of his political career. Dyson’s telling of the meeting ends with the depiction of white fragility as the younger Kennedy throws a tantrum when faced with the reality of not being the most informed figure in the room when discussing race in America. The meeting, which included Baldwin, Lorraine Hansberry, Lena Horne, Jerome Smith, Harry Belafonte, and more, was meant to act as a strategy session to bridge race relations in America. Yet it turned into the Civil Rights Activists holding Kennedy accountable for what little action he was willing to take and insisting that he acknowledge the everyday struggles of black Americans. Kennedy eventually acknowledged the validity of their frustration, but, as Dyson notes, Kennedy was left with a bruised ego. The significance of the meeting is not just the entertainment of knowing that this meeting took place, but that it provides a truthful account of the actions and consequences of ignoring truth due to pride. 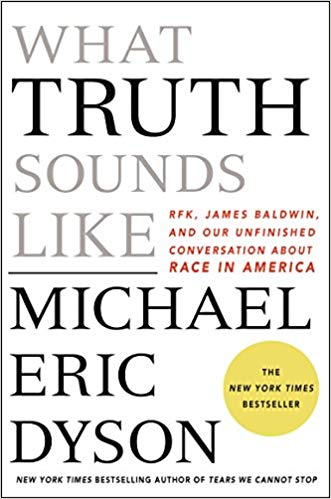 A story about Kennedy being forced to listen to the truth from the perspective of those who aren’t white and privileged in American society is followed by an analysis of American politics. Dyson breaks down the ways in which being non-white was never an innate part of the American identity, how Obama’s blackness threatened the understanding of what the identity of America is, and how politicians like Trump — I use the word ‘politician’ very loosely when applying it to him — and Bernie Sanders, despite their beliefs’ being on opposite ends of America’s political spectrum, continue to prevent blackness from being a visible part of America’s identity. Dyson claims that Sanders’ insistence of acknowledging the separation between Americans as a class issue rather than a race issue is complicit in the use of revisionist history and the Rights refusal to acknowledge how a history of legal racism continues to negatively impact black and brown communities. ​Acknowledging that many of those whom Kennedy invited to that secret meeting were artists, Dr. Dyson then explores the history of black art and how artists who were also activists used their art to provoke thought. He compares and contrasts their methods of creating conversations surrounding black identity with an analysis of Harry Belafonte, Jay-Z, and Jesse Williams. Dyson states that Belafonte was particular about the space he filled so white people could start to envision black people in those spaces, slowly manipulating them into letting go of small pieces of their bigotry by recognizing his presence in those environments through the use of “respectability politics.” Whereas, Jay-Z played into stereotypical depictions of black men, but then used that popularity for financial gain. Dr. Dyson uses Belafonte and Jay-Z to showcase the evolution of the tactics of black artists, how their differences created a divide between those who use the language of hip-hop to express themselves and their conflicting ideas of what the black identity of America should look like in a society where black people are viewed as monolithic. After providing an analyzation of gender and sexuality in the presence of black art, he then looks to artists like Chadwick Boseman, Lin Manuel Miranda, Jordan Peele, Leslie Odom, Jr., and Keegan-Michael Key to further express how modern artists address the conversations surrounding black identity in their art. He writes, “Black artists have consistently sought to uplift the redemptive dimensions of black life as they seek to defend black culture from the vicious assaults of hostile forces.” Some may argue that one cannot separate art from the perspective of the artist and that will always make work by black artists ‘black art’ even if their blackness is not addressed in the piece. It does call into question whether or not it is fair that any work produced by a non-white artist is often given additional layers of social commentary. For example, if white artists paint a picture of a New York City street with old and unkempt apartment buildings it would most likely be reported that the artist is making visual commentary about pollution in America, whereas if a black painter painted the same image, reviewers would most likely also connect it to classism and the living conditions of black Americans in segregation. After discussing the challenges faced by black artists, Dr. Dyson discusses the need for black intellectuals, who he believes “diagnose and confront racial catastrophes and political crises in a fashion that helps those who take action against these ills gain a better sense of what is at stake.” This is followed by two chapters which discuss the past and current roles black activists play in society. In “The Activists 1” Dr. Dyson demonstrates the ongoing conflicts between white liberals and black activists by continuing the discussion of the meeting and its goal to “tell Bobby [Robert F. Kennedy] about the suffering that had scarred each black person in that room …” and today’s black activists' ongoing conflicts with today’s white liberals, such as Hillary Clinton, who was, “compelled to forcibly reckon with the existential witness of black trauma.”. This chapter is followed by “The Activists 2,” which dares to confront white America’s reaction to black athletes who use their platform to generate discussions of race in America — who “break the mythology of a race-less and neutral American identity.” Dr. Dyson provides a history lesson on Muhammad Ali and how they have inspired athletes like Lebron James and Colin Kaepernick, which has ignited a wave of hatred and ignorance regarding the trauma that continues to surround black existence in America. Dr. Dyson finishes his account on the meeting and declares that it ultimately changed Kennedy for the better and that, while black America didn’t get to experience much of the progression that meeting caused for Kennedy, the story itself is proof of what happens when one is vehemently faced with the truth. So, when Dr. Dyson ends his book with a chapter titled, “Even If: Wakanda, Forever,” he is leaving his readers with the hope that, despite steps that seemingly appear small, minds are being changed and perceptions are being challenged. That the albeit fictional world of Wakanda is a culmination of everything Dr. Dyson has used this book to tell us that black people are resilient, that black art is complex, that black intellect is beyond the limits placed on us by the structure of white society, that black existence is the celebration of freedom, and that the treatment of black lives is the truth of America. So, I will end this essay the same way Dr. Dyson ended his book: Wakanda, forever.